So I've recently bought myself a tall glass jar and have no idea what to do with it. I've filled my other jars with stars and mini cranes but I'd like to do something different with this one. You can hot glue some cute charms on the lid of the jars and let it dry. Fill th jar with glitter and water and put the lid on and there you made a snow globe! 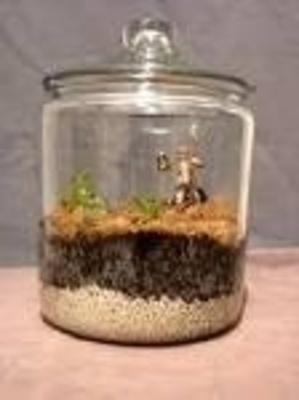 Or you can build a little terrarium! Decorative storage, sand(colored) art and shells,according to the size you can display seasonal objects (even fruit is pretty), bathroom storage for cosmetics/brushes, nail polish storage ( use a couple and group them by colors). I recycle jars (from pantry items such as pasta sauces & pickles) paint the lids and add a wooden ball or cheap drawer pulls to the lid and you can make some pretty and useful canisters to store about anything you can dream of. My sister has some and she changes it based on the season / holiday.